Back in October, I introduced in my newsletter article the concept of the liminal zone as part of any congregation’s process of change. Now, in the new year, this seems even more relevant to our life as a community, so it seems fitting to revisit this again. 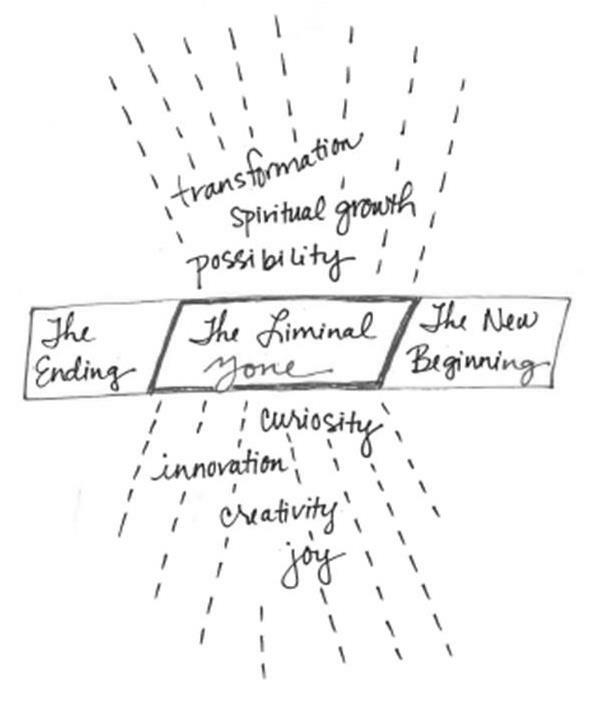 William Bridges identifies 3 phases of transition: the ending, the liminal zone (or as I call it “the zone”), and the new beginning. The ending: As something comes to an end, it’s common in this phase for emotions to be conflictual: grief and hope, joy and anxiety, shock and surprise. The liminal zone: In this phase, we may want to move quickly to the new beginning to avoid feelings of discomfort. We must resist this urge, and instead consider new ideas and have a lot of conversation, letting ourselves be a little (or a lot) uncomfortable with this reality. The key here is to stay in there together and express what we’re thinking and feeling and by all means, keep on praying for the wisdom of God to guide us in our decision making. The new beginning: Having arrived together in a new normal, we can gratefully receive the blessings that God has given — the fullness of our life together as a congregation, the relationships that have deepened, and the sense of newness that brings a fresh commitment to our shared mission. What does this have to do with the church? “Vulnerability is the birthplace of innovation, creativity and change.” And coincidentally, it’s also the seat of belonging. The zone is the place where, if we are brave enough to be vulnerable, we can celebrate our history, begin to let go of what was, and shape a new future together and with God’s help. Expanding this a little farther, we realize that there are neighbors who will be moving into this neighborhood very soon. These neighbors will have their own needs, interests, and desires to live in community. What will we do with these gifts of the Spirit? How is the Holy Spirit leading us? What is God whispering in our ears? I for one want to tune in – to listen deeply – to what’s next in this exciting time in the life of this congregation, this neighborhood and this world. Join me. Join me in listening as God enters our neighborhood and our lives in new ways. myjiogames.com on Can Faith Unite Us? © 2019 Amazing Grace. Powered by churchthemes.com.